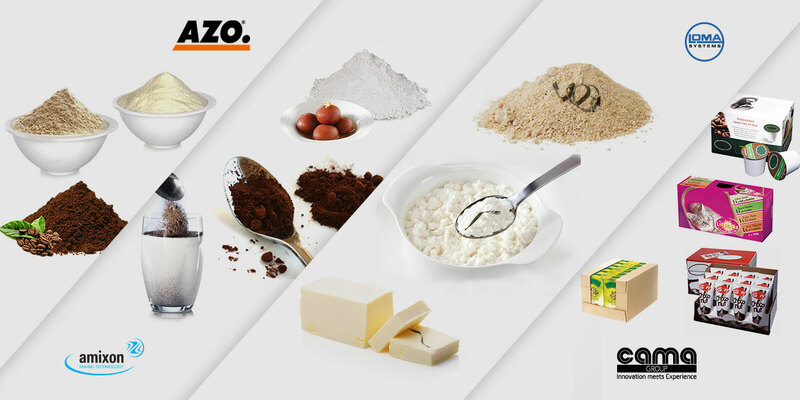 Dairy sector handles both non agglomerated and agglomerated powders and need particularly careful handling, mixing and conveying to protect product structure, especially when multiple handling stages are involved. AZO and Amixon are pioneers in a wide range of pneumatic powder conveying system and mixing technology. AZO offers a guaranteed system design from positive pressure and vacuum conveying systems to dense and lean conveying ensure minimal breakdown of these powders along with software control while Amixon has a patented vertical shaft mixing technology offering shortest mixing time with almost 100% discharge for dry, moist and viscous material. Loma is the pioneer in metal detection, x-ray and check weighing solution. Primary packaging and Secondary packaging solutions are provided by Theegarten-Pactec and Cama Group.